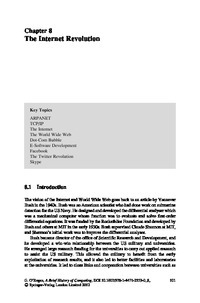 Chapter 8 discusses the birth of the World Wide Web. Its invention by Tim Berners-Lee built upon existing technologies such as the Internet, mouse and hypertext to find a solution to the problem of keeping track of the work of visiting researchers at CERN. Its invention has revolutionised the computing field. This chapter considered the evolution of the Internet from the early work on packet switching and ARPANET, to the subsequent development of the TCP/IP network protocols that specify how computers communicate and the standards for interconnecting networks and computers. TCP/IP provides a transmission standard that deals with physical differences in host computers, routers and networks. It is designed to transfer data over networks which support different packet sizes and which may sometimes lose packets. TCP details how information is broken into packets and reassembled on delivery, whereas IP is focused on sending the packet across the network. The invention of the World Wide Web by Tim Berners-Lee was a revolutionary milestone in computing. It transformed the Internet from mainly academic use to commercial use and led to a global market of consumers and suppliers. Today, the World Wide Web is an integral part of peoples’ lives. The growth of the World Wide Web was exponential, and the boom led to the formation of many ‘new economy’ businesses. These new companies conducted business over the web as distinct from the traditional bricks and mortar companies. Some of these new companies were very successful (e.g. Amazon) and remain in business. Others were financial disasters due to poor business models, poor management and poor implementation of the new technology.